Enjoy the thoughtful reflections of our darling bride Janelle as she shares how the movie "UP" inspired their love story and how a thoughtful photographer helped with their inspiration! DJ & Janelle Where: Father Hennepin Bluffs Park, Minneapolis Photographer: Melissa of La de da Photography. via Janelle We had had a rough day, the wedding was getting close and there was still a ton of stuff to do. We were never really ahead of the planning curve! Plus, we were trying to squeeze the session in before DJ's softball game. Needless to say were both a little edgy. Melissa showed up all smiles and told us she had a surprise for us. We looked at each other nervously and she popped open her trunk to reveal an enormous cluster of balloons that she had brought for our session. Immediately we relaxed and the session was a success. Inspired by the movie UP... DJ and I watched "UP" together shortly before we got engaged. We were so moved by the movie! It is a beautiful yet tragic love story. We have always talked about the "adventures" we look forward to in life so we really connected with the story. 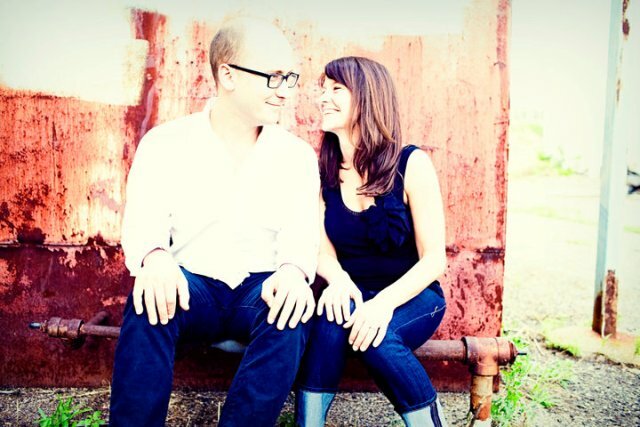 I told Melissa about my idea early on when I met with her about being our photographer. 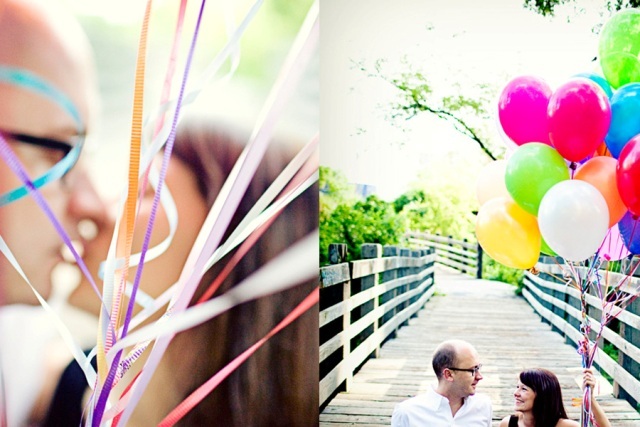 Somehow that stuck with her, when she showed up to shoot our engagement photos, she brought a car load of balloons. We liked the balloons so much that Melissa brought another load for the wedding. I think a lot of people worry that commitment and marriage mean sacrifice, settling down, and an end to to fun. We promised each other that we would still have "Adventures" in our new chapter of life. 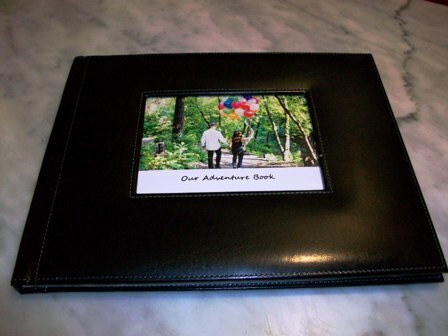 As we started wedding planning I continued to think of the movie and loved the idea of the "Adventure Book" that showed the couples' childhoods, courtship, marriage, and life after. I immediately thought it would make the perfect wedding gift for DJ. I rounded up pictures from our families and made a similar book for him to showcase our past and present with the promise of volumes to come to represent our future. How cute!! Love it! The colors of the balloons are awesome in the pictures. 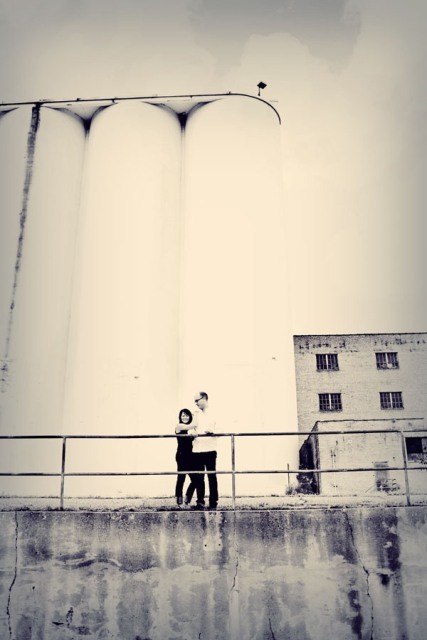 Thank u heidi for featuring this engagement, these two were a blast! Thanks for bringing this inspiring photo shoot! Love it! These photos are great! I love the vintage feel to them as well as the inspiration from the movie UP. I cried at that movie and understand why Janelle would want to live with the same life adventure.